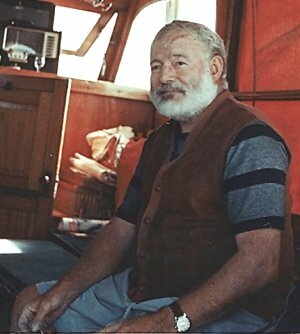 Ernest Hemingway was a fisherman. From the time he was a child he loved to fish. Two of his stories are about fishing; The Big Two-Hearted River and The Old Man and the Sea, which in 1953 won the Pulitzer Prize and in 1954 the Nobel Prize* for Literature. Grace Hall, Ernest's mother was a singer. She wanted to sing in the opera, but the strong lights bothered her eyes, so she moved back to her hometown and gave singing lessons. She married Ernest Miller Hemingway and they had five children. Ernest had an older sister and two younger sisters plus a little brother. Both of his grandfathers had been in the military in the Civil War. He grew up with an interest in military service which would affect later decisions in his life. The family was religious. They went to church on Sunday and had Bible study and prayers at home. Ernest was an active boy and accident prone. It was good that his father was a doctor and able to help him through those rough times. He behaved recklessly and kept trying to prove his courage. This pattern continued throughout his life. As a child he enjoyed reading and writing. In grammar school he wrote a story called, "My First Sea Voyage" which was really an experience borrowed from his uncle. World War 1 had started when he finished high school and he wanted to join the army, but he was underage and his father wouldn't give him permission, so he became a reporter with the Kansas City Star. When he was of age he still wanted to join the army and his poor eyesight disqualified him, but he did become an ambulance driver for the Red Cross. They sent him to Italy to a field hospital in the mountains. It was not exciting enough for him so he asked to be transferred closer to the front lines where there was more action. Early in the war the Italians were neutral. * During one battle he rescued an Italian soldier and was awarded the Italian Silver Cross of Merit. He was taken to a hospital and there he fell in love with a nurse named Agnes. She was nearly 30 and he was a teenager. That didn't work out for him. Later he would write a novel about those experiences, A Farewell to Arms. When he returned home he met another woman, Elizabeth Hadley Richardson, who was eight years his senior. They married and went to live in Paris to further his career. While vacationing in Spain they attended the bull fights and he even participated in the running of the bulls. When his son was born he was named Nicanor after a famous matador* Ernest admired. Francis Scott Key Fitzgerald (F. Scott Fitzgerald), a relative of the man who wrote the "Star Spangled Banner", was a well-known novelist. He took an interest in Hemingway's work and helped him get a book published. The Sun Also Rises was highly acclaimed. He divorced his wife Hadley and married Pauline Pfeiffer. They returned to the United States and settled in Key West, Florida. They had two sons Gregory and Patrick. Ernest Hemingway did not like to be called by his first name. He wanted to be called "Papa Hemingway". He began to be critical of other writers, even those who had helped him become famous. He lost friends because of the way he treated people. In 1936 when the Spanish Civil War started he became a war correspondent. * It proved to be disastrous to his marriage because he met Martha Gellhorn. He divorced Pauline and married her, but unlike his first two wives Martha would not play the role of the devoted wife. In 1945 at the end of World War 2 he divorced Martha and married Mary Welsh and they settled on a small farm in Cuba. When he published The Old Man and the Sea it was an instant success. Sometimes he received 100 letters a day as people praised his work. In 1954 on a sightseeing flight from Nairobi, Kenya a flock of birds caused their plane to crash. Fortunately, he and Mary survived the crash. When Fidel Castro started leading an armed rebellion in Cuba Hemingway decided it was getting too dangerous there and bought a home in Idaho. He began to imagine people were "after him", though they weren't. Life magazine asked him to write an artice about bullfighting, his favorite spectator sport. His artice was so long it was eventually made into a book Dangerous Summer which was published in 1985. He continued to decline mentally. Mary his wife urged him to get help when he started talking about taking his own life. He did seek help, but his depression* continued. On July 2, 1961 his life came to a tragic end. When he died he had five unfinished manuscripts* which were later published. 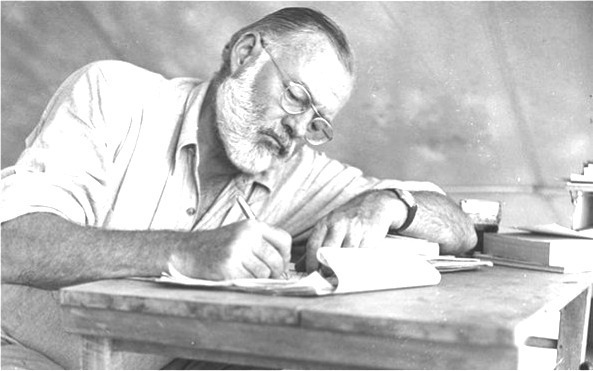 His widow Mary founded the Ernest Hemingway Foundation. We admire the literary genius of Ernest Hemingway, but we cannot recommend him as a role model for young people because of his reckless lifestyle and infidelity. 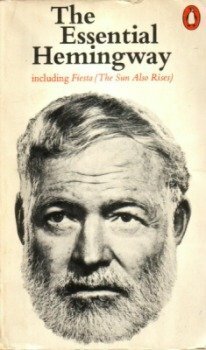 This biography by Patsy Stevens, a retired teacher, was written in 2010.
from the Spanish word meaning "killer"
At biography.com search for Ernest Hemingway. Press "Go" to search for books about Ernest Hemingway. This page displayed 43,233 times.